Houghton Lake, Mich. — The ninth ranked division three Oscoda Owls faced Beal City on Tuesday for the Regional Semifinal. The Owls jumped to an early 9-4 lead after sophomore Owen Franklin knocked down his first of two 3-pointers in the game. Junior Brayden Mallak added a first quarter buzzer-beater layup to keep the momentum in Oscoda’s favor, but it was the defense that stepped up holding all-state guard Logan Chillman to only four points in the first half. Chillman would finish the game with 20 total. Oscoda’s bigs stepped up down low on offense and defense making it tough on the Beal City guards that wanted to drive and feed their Aggie bigs. 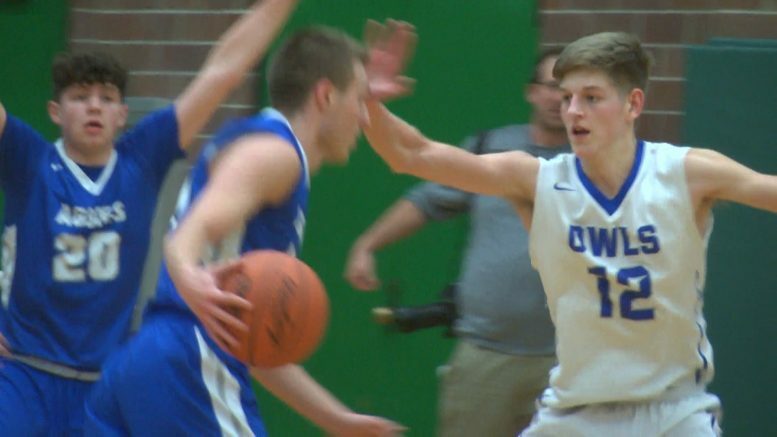 No luck for Beal City, and the Owls defeated the Aggies 51-33, improving to 24-0. Up next, Oscoda takes on seventh ranked Sanford Meridian Early College on Thursday at 7 p.m. in Houghton Lake. During the Regional Semifinal prior to the match between Oscoda and Beal City, Meridian finished with four players in double digits: 6-foot-4 Gabe Brady (22), Kyle Stockford (20), 6-foot-5 Lucas Lueder (13) and Trey Plichta (11).